I am not a morning person, but my kids are. 6 AM hits and both kids are awake and happy and I am still trying to drag myself out of bed. I recently kicked my caffeine habit and I have been working toward a healthier lifestyle, so I wanted something that I could count on in the morning to give me energy, help perk me up a little bit and that didn’t take a long time to make. My go to has become this chocolate peanut butter banana shake. It has everything I need to chase my little ones around until lunchtime and the best part is that it is Vegan. Real whole food. It is easy to make and the ingredients are simple ones I have on hand. Slice your banana up into slices and then add everything to a blender, topping with the ice. Blend it until smooth. 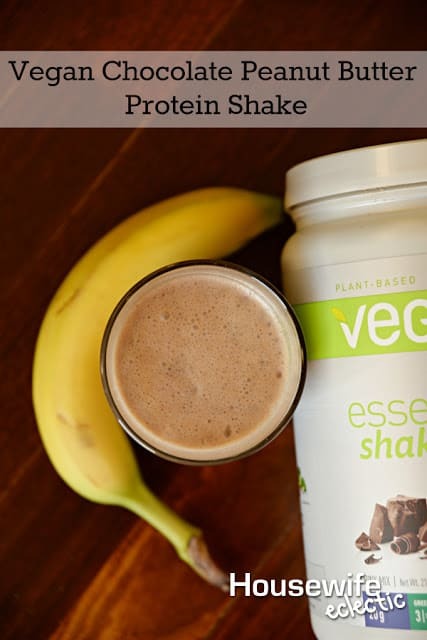 When I am making smoothies I use Vega Essentials Protein Powder because it is made from whole food ingredients and has 20 grams of plant based protein per serving. It has 25 % of your daily intake of food based vitamins and minerals as well as fiber and Omega 3s. It is Non-GMO Project verified, gluten-free and made with no added sugar or artificial flavors and colors so when one of my little ones wants a sip of my shake, I can feel great about letting them have some. If you have any questions about Vega Essentials, you can reach out to the company here. I am trying so hard to eat right and exercise every day. I want to be strong and Vega helps me focus on that goal. I also really like the taste of the protein powder. I have hated protein powders for years because of the nasty chalky taste they leave in my mouth. I haven’t experienced that at all with Vega. My shakes or drinks always taste fantastic. 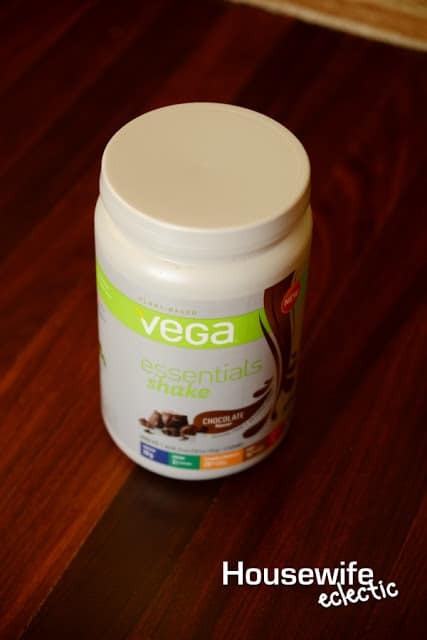 What kind of shake would you make with Vega Essentials? What a great combination! I love that it is healthy for you too. I don't have a blender-my mini one finally broke and I am allergic to bananas! However that powder probably tastes really good if you ise just a shaker bottle with the Almond Milk–think I might try it. 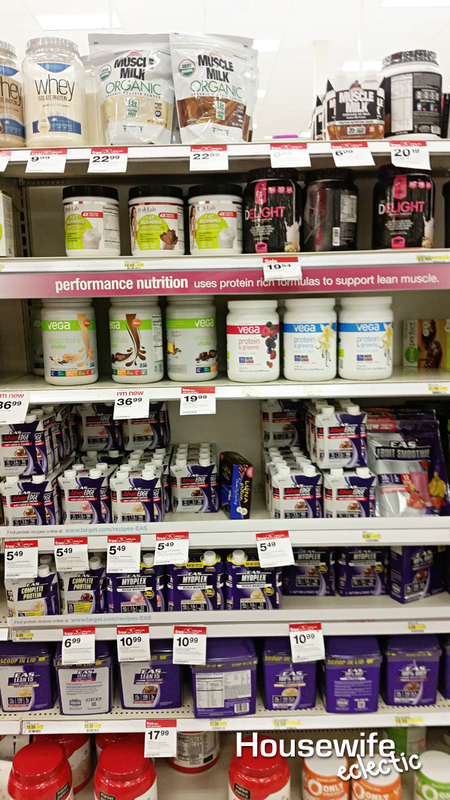 I do love smoothies for convenience and taste, but I steer clear of protein powders and supplements as a general rule. I'd rather get my whole foods from actual foods, that way I con control what's actually going into my meals. This looks like such a great alternative to coffee, and it looks so healthy too! I'll definitely have to try this out, thanks for sharing! This looks so good! 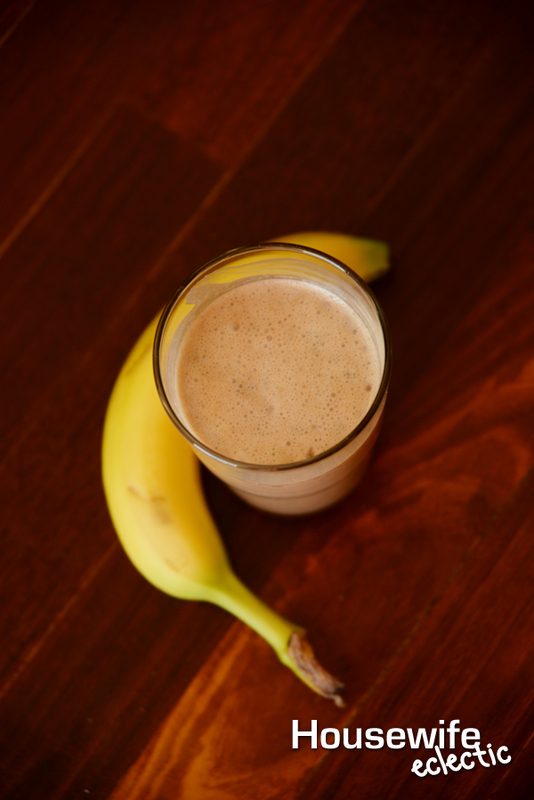 I love banana shakes and smoothies, so I will have to try your recipe! It sounds delicious! I really like almond milk in cereal, and just plain in a glass, I used to put it in my coffee, but it does not go for some reason. But in a shake with bananas, yum! Good for you o kicking the caffeine, I haven't quite had the courage to do that one! I always want to get up and make a shake or smoothie like this. It looks so good. This looks delicious! I need to kick a coffee and sugar addiction both! 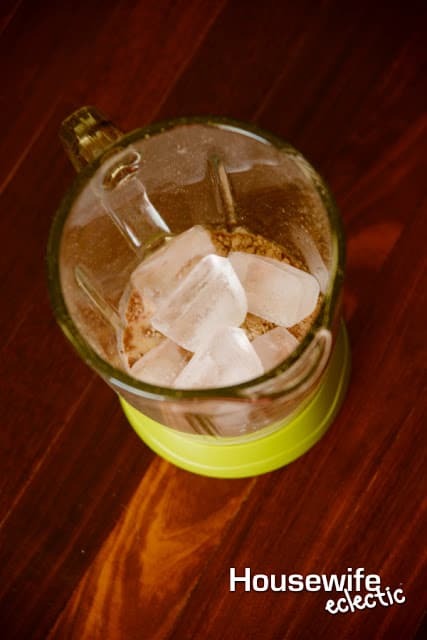 I love the sound of this shake it sounds delicious and especially since it is vegan too! This sounds like it will make a really tasty protein shake. I usually avoid protein shakes because they can taste pretty bad. Well done for putting healthy things in your body! That looks delicious! I love the boost of protein here! I know my kids would appreciate it since they work out frequently. This is so timely. I just found out I'm protein and iron deficient so this will totally help me! Some of my favorite flavors together! Chocolate, banana, and peanut butter are a hit for sure! The added protein makes it all the better. Now this shake sounds yummy! Love that you used almond milk as well! I'm all about the almond milk! This is a great alternative to coffee, for sure! I bet that alone can give you a little more of a boost throughout the day! I love making smoothies, what a great idea for breakfast, too! I am not a big fan of PB in my smoothies, but I do love the idea of using almond milk! This is my daily go-to right now! I like to freeze the bananas (peel them first….I learned that the hard way!) so it makes it kinda like a milkshake.